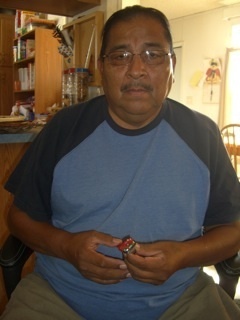 Raymond Sequaptewa, whom I’ve known and represented for fifteen years, is a most unusual American Indian artist. 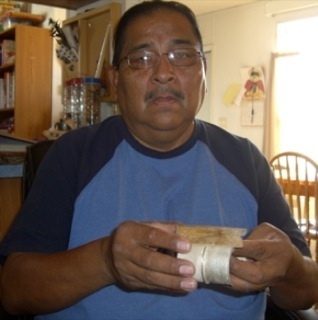 A Hopi from Third Mesa, Raymond Sequaptewa is not only a jeweler but also a healer who treats people beset with malaise of various kinds. He is more steeped in traditional Hopi beliefs and mythology than any other artist I know, and this certainly comes through in his work. His jewelry is dramatically one-of-a-kind, totally original in character and can never be confused with anyone else’s work. Healing is a significant theme in Raymond Sequaptewa’s jewelry. After a kidney replacement and cardiac bypass surgery, Raymond suffered a near death experience and lasting dreams that have provided quite a bit of inspiration in his work. Sequaptewa’s belt buckle entitled “Strong Rain” is entitled such because “strong rain is happy tears to heal you.” How wonderful! Raymond’s jewelry isn’t always just about healing, though. Sometimes, his work is simply depictions of things he sees in nature, or in human nature. How neat is Raymond Sequaptewa’s Bullfrog buckle. Notice the way Raymond has created a somewhat abstract bullfrog out of the materials he has chosen. There’s also a Raymond Sequaptewa bracelet entitled “Dedicated to Women,” in which Raymond attempts to illustrate the “inner complexity of women” through a hinged door on the bracelet that opens to reveal a web of sinew and coral. Look at the pieces I’ve included here, and I think you’ll agree that there is a strong spiritual, even mystical quality pervading everything Raymond Sequaptewa does.